Sumba, formerly known as the Sandalwood Island, is known foe its horses and Sumba clothe. Sandalwood was the only known cure for many diseases until penicillin was invented. The Sumbanese traded with the Chinese until the 16th century, after which the Arabs became the most important trading partner until the early 20th century. The island is famous for its arts and handicrafts, particularly the textile "ikat" weaving. Sumba, however, is not for everyone. Neither the food nor accommodations are up to international standards. But if we are willing to make a little effort we can see an authentic, ancient culture with none of the layers of Hinduism or Islam mostly found elsewhere in the country. 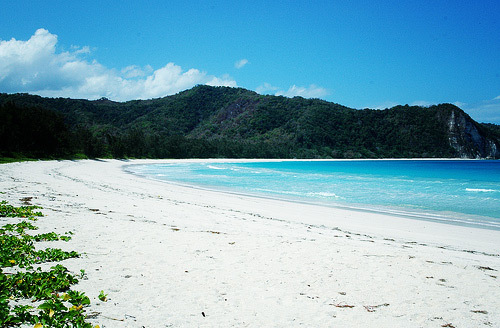 The island has a small population and a dry tropical climate. In total Sumba have more hours of sunshine than any other place in Indonesia. The land resembles Southern Africa or Australia, with scattered small villages and herds of cattle and buffalo Sumba is off the beaten track. Transport system and roads are infrequently used. Most hotels in main towns are simple, only catering for the adventurous. However, CNN etc. are available for those wishing to stay in touch with the outside world. Beaches are long and clean. Water is clear and abundant in fish, and there is great surf. The island is roughly oval in shape. The greatest concentration of those who worship sprits (ancestral and those of the land) is found in West Sumba where two-thirds of the population holds on their traditional belief. It is here where incredible rituals take place, the "pasola" where hundreds of horsemen fling spears at each other. The government allows the ritual to take place, but the spears must be blunt. Although some exist in East Sumba, it is in West Sumba that one can find a greater number of huge megalithic tombs and traditional thatched and peaked huts raise on stilts. Many traditional activities, all with a part paying homage to the spirits, take place in the month of July through October. These include the building of "adapt" houses and burials when sometimes hundreds of pigs, water buffaloes, horses, and dogs are sacrificed. Other ceremonies include the "pajura" or traditional boxing, the festivals for lunar New Year in October and November, and August 17, Independence Day, horse races and ritual dances.